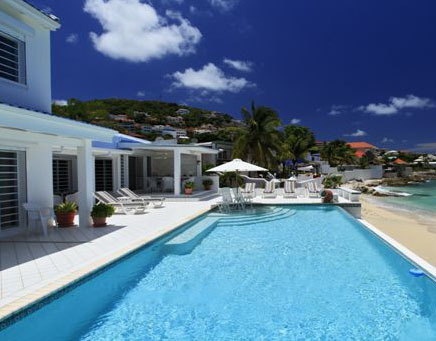 Stunning French Creole villa for luxury rental located in the exclusive area of Guana Bay, Dutch Sint Maarten. Situated on an acre of tropical gardens, Villa Mahogany is an elegantly appointed residence providing the ultimate in relaxation. Enjoy ocean views and breezes as you dine alfresco on the covered terrace overlooking the pool and the view of St. Barth’s. Located within a 2 minute walk to the secluded white beach of Guana Bay, where you can swim and sunbathe in quiet serenity or take an early morning jog along the half mile stretch of shoreline. Bask in the Caribbean sun or relax in the over-sized pool while enjoying your favorite libation. The prestigious residential community of Guana Bay is a short distance to the duty-free shopping capital of Philipsburg. Nearby you will find some of the world’s finest dining, night-life and casinos. Caribbean Blue is a beach front villa in Pelican Key. With five bedrooms and five and an half bathrooms, it is a perfect house for a family vacation. Caribbean Blue may be rented with use of either 3, 4 or 5 bedrooms. The deck iwith private pool at Caribbean Blue is the perfect spot for enjoying the sun and sea, and has wonderful ocean and a view of the island of Saba, and of the sunset. It could be a great family rental. Pelican Key is a short distance to restaurants, a casino and a movie theater. This gorgeous, very secluded and peaceful 5 bedroom villa kisses the shore of Simpson Bay Lagoon and has it’s own little beach from which to soak up the sun – that is if you can pull yourself out of the hammock! If you are looking for a place to completely rejuvenate body soul and mind, this is it. Greek for heaven, or a blissful place, Elysium lives up to its name. With media room, a private gym, full gourmet kitchen complete with stainless steel and granite countertops, pool and Jacuzzi – even a high tech massage chair, you will have more than you need for a memorable vacation. All of this concealed on 3.5 acres of lush tropical gardens, yet is conveniently located to shopping, restaurants, night life and casino gambling not to mention gorgeous beaches and golf. Marigot is a 12 minute drive, the nearest grocery store is a 5 minute drive, and the gentle waves of the lagoon are just outside the door. Spectacular!! 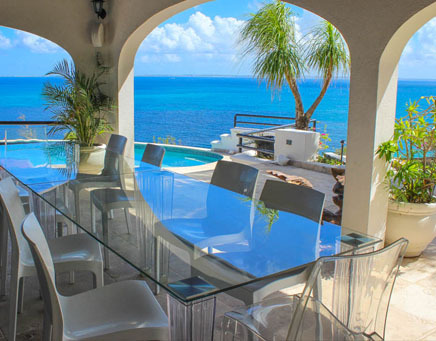 Nestled above the Caribbean sea, on exclusive Monte Rouge, French St. Martin, villa Ait na Greine offers breathtaking views in a magnificent setting. Brazilian walnut woodwork, white marble floors and crystal fixtures add a contemporary feel to the vibrant Caribbean decor. Each of the four bedrooms has a private bath ,air conditioning and ceiling fan. The kitchen is a large and fully equipped. A state-of-the-art, user friendly entertainment center is available throughout the villa. 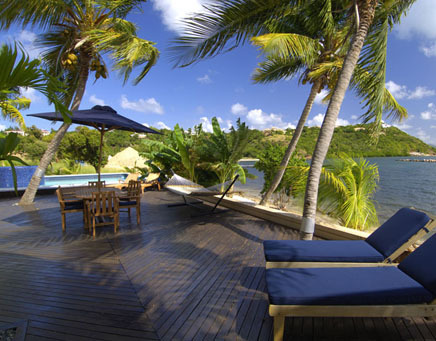 While lounging by the pool or in the shade of the terrace, enjoy the soft sea breezes scented with jasmine – whether relaxing or entertaining, all your needs will be met at villa Ait na Greine……..the Caribbean and all its splendor. 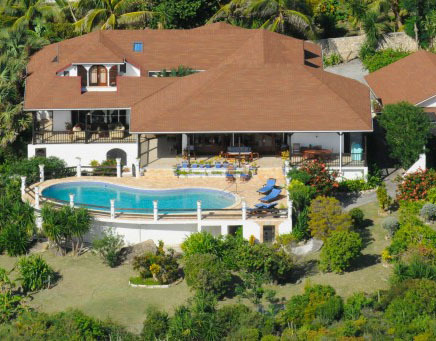 This is a beautiful oceanfront 5 bedroom, 4 bathroom property that is located in a nice quiet area of Beacon Hill overlooking Burgeaux Bay on Dutch, St. Maarten.This villa offers amazing colours in the morning and unique sunsets. 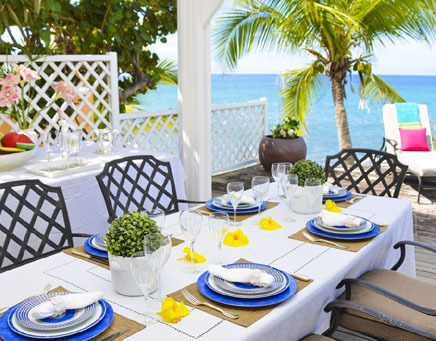 The villa is located within walking distance to great restaurants such as Bamboo Bernie’s, Le Moulin Fou, Le Petit Paris, La Rosa and many more. 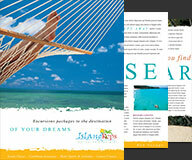 They are also walking distance to entertainment, casinos, nightlife, beaches and supermarkets. The main level consists of 4 bedrooms, 3 baths, living room, dining area, kitchen, patio and pool with sun deck. The master bedroom is located on the upper floor with a study which has an outstanding view of the Caribbean Sea.Staying at this villa will create memories that will last a lifetime.